Today it was finally time to dredge up this segment. It's been just over 9 months since I reviewed a beer in this category and I guess I was just waiting for the right beer. Tripel Karmeliet is brewed by Brouwerij Bosteels, the same brewery that produces Pauwel Kwak a personal favourite of mine. From my experiences Tripel's can either me very good or very bad, there doesn't seem to be the middle ground that you find with a number of other styles. Having spoken to quite a few people about this beer I think it's the kind of Tripel that I like, but only time will tell... I'm also slightly surprised I've never had this before, I certainly see it around enough! Tripel Karmeliet pours with the famed head I have heard so much about. The glass is huge for this reason and almost manages to contain the huge cream coloured head. The body of the beer looks almost like honey, it's appears to be quite thick and to have reasonable carbonation. With a head this big it's pretty obvious to say that the head retention is good, but the lacing is also excellent. This is one of the best looking beers I've seen for a while. At first all I can smell on the nose of Tripel Karmeliet is a spicy alcohol presence. As the beer warms up the nose becomes much more complex, but with spices still to the fore. Cardamon, cinnamon and cloves are all very prominent. There is also an element of fruitiness but it definitely plays second fiddle to the spices. Like a number of Belgian beers there is a hint of warming alcohol on the nose, but it fits into this nose beautifully. WOW! Tripel Karmeliet tastes like no other Tripel I've ever had. The flavour depth is incredible with the spices spicier than I could ever have imagined. While the fruit flavours become more pronounced with peaches seemingly the most prominent now. The mouthfeel is so silky and the tingle left by the carbonation on the tip of the tongue is just perfect! The extra alcohol gives this beautiful dry finish that I am really struggling to find fault with. I think the conclusion to draw from today is that I don't drink anywhere near enough Belgian beer! It's one of the best put together beers that I can think of. Every single element of the beer adds to it, there's nothing that's just been put in for the sake of it. 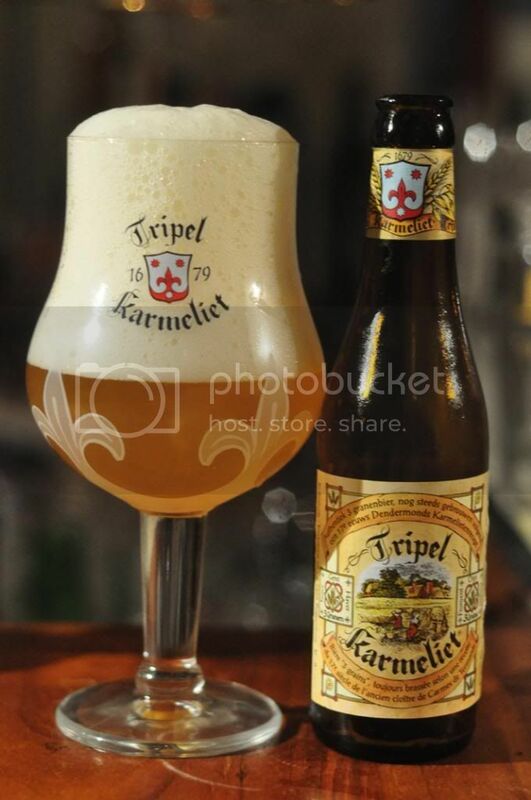 Tripel Karmeliet really is world class! If you like Belgian beers or even if you don's this is a beer not to miss!